As the mercury starts hitting those high 20s, it’s time to start thinking about the inevitable - how you’ll keep cool this summer. Whether you’re a double scoop in a cone, single scoop in a cup with a wafer, or triple scoop with whipped cream and a cherry, you’re sure to find a sweet treat to meet your ice cream dreams on our list of Brisbane’s best. Initially opening in Teneriffe in 2012, La Macelleria is the real Italian deal! 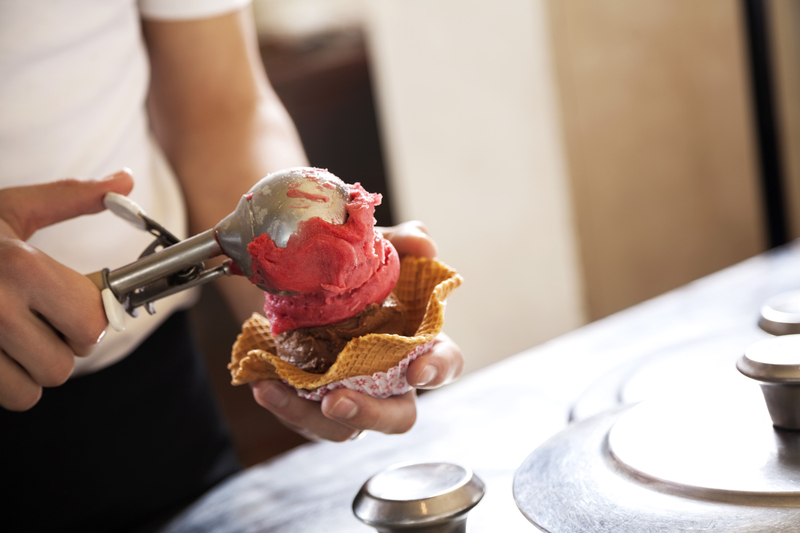 The owners, both called Matteo (not kidding) are committed to crafting authentic, Bologna-style gelato, offering classic Italian flavours like fior di latte, crema Bologna, and new favourites like raspberry cheesecake. With their second venue opening in West End last year, La Macelleria is the neighbourhood favourite at both ends of the 199. Three words: Ekka strawberry sundae! These guys have been producing the strawberry ice cream that goes into your face Ekka dessert for the past seven years, so they’re iconic to say the least. Lick’s huge range of flavours features interesting combos like mango and toasted coconut, white peppermint choc-chip, and caramelised condensed milk-we’ll take a scoop of each! This New Farm institution is hard to miss, with their super cute old-school signage and murals. Join the New Farm nonnas tucking into an afternoon scoop of cioccolato, crunch on a cone post-movie, or add five mini scoops of your choice to a plate of fresh poffertjes for a real treat. After taking out the Grand Champion Dairy Product in 2017 for their dark chocolate gelato, Milani House of Gelato cemented its place on any list of Brisbane’s best. Owner Yue Lin, who trained in Italy under a Master gelato chef, sources the best ingredients available, and hand-makes the gelato each and every morning. Keep it simple with a scoop, or go all-out with one of their decadent desserts, like Death By Chocolate, stacked with chocolate and vanilla gelato, chocolate chips, chocolate topping, whipped cream and… more chocolate. 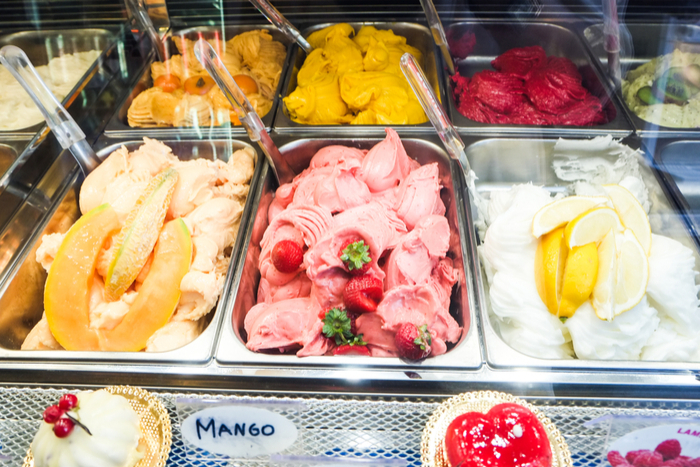 Nestled slyly behind the popular Bulimba eatery is the Sugo Mi Gelateria, featuring their award-winning gelato and sorbet. Made in-house, their popular favourites include coconut and white chocolate, toasted marshmallow, and a classic salted caramel! Pizza out the front, ice-cream out the back? We’re in! If you don’t remember the hype when this Sydney institution opened its first store in Brisbane last year, which rock were you living under? Serving up funky flavours in a funky space (with tunes to match) Gelato Messina are truly the rockstars of the ice-cream world. Pull up a seat outside and enjoy any combination of the 35 signature classic flavours as well as five rotating weekly specials. Meet me at the bar… the dessert bar. Cowch serves up some seriously special dessert items, including a whole-range of ice cream treats! Try their Moo Burgers-toasted brioche buns stuffed with ice cream of your choice- or go all out with a Pearl Berry Sunday, with vanilla ice cream, strawberry coulis, mochi, pearls, diced strawberries, and whipped cream. Dairylicious! A great suburban gelateria in its own right, Ciao Gelato really made a name for itself with its range of vegan friendly sweets. Their rice milk, coconut milk, and almond milk-based desserts are great for vegans who have had enough of watery sorbets, and Ciao also offers accidentally vegan cookie dough gelato cupcakes and brownies. Every week locals vote on the special flavour for the next week- true dessert democracy. It may not be Dominique Ansel Bakery, but Double Good’s stall at Eat Street is dishing out some seriously good ice cream treats, like their take on watermelon soft serve in a watermelon wedge! Did we mention their eight-flavour soft serve machine? The first of its make in Australia, customers can choose any combination of the flavours, which include Dutch chocolate, burnt orange, butter pecan, and pistachio. Definitely a must-do on your next trip to Eat Street. - the gourmand who shouldn't eat dairy... but does.